Stick It Adhesive HANDY PACK 5 Sheets SK155 at Simon Says STAMP! SK155 /1.0 /200 This item is on reserve until If you would like to reserve this item now, you may purchase it now with the rest of your order. We will hold your order now and ship your entire order as soon as this item is back into stock. If you would like your order to ship now, please place this item on a separate order. Success, Stick It Adhesive HANDY PACK 5 Sheets SK155 has been shared! Stick It is a brand new adhesive product that makes the whole process of applying adhesive to intricate die-cut shapes so quick and easy. It is incredibly thin - not much thicker than a piece of paper- yet it encompasses a high tech adhesive that is both strong enough to endure the incredible pressure that die cutting machines impart, but pliable enough to match the contours of your intricate die cut shapes without squeezing out the edges or leaving a sticky residue on your dies and equipmant. 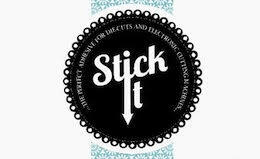 Stick It has been specially formulated for intricate die-cutting and electronic cutting machine applications and will remain repositionable for a period, becoming permanent over time. Fabulously talented US based designer, artist and crafting celebrity Ken Oliver, has developed and manufactured a new product that fills what we all think is a big gap in the market. With die-cutting playing a much bigger part in all of our crafting lives with all of the various manufacturers introducing new designs that are ever more intricate - we've all struggled to apply just the right amount of adhesive to the reverse of all of these intricate shapes in order to be able to incorporate them into our projects - well not any more! Stick It is the solution!